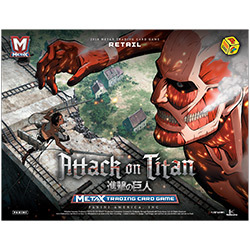 Panini Games has announced the first two products for its MetaX-driven trading card game Attack on Titan, releasing March 30. 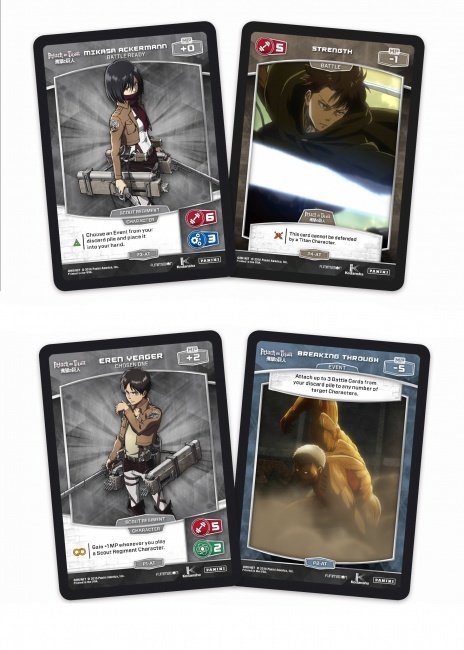 Announced last year (see ��Attack on Titan� TCG�), the Attack on Titan TCG is built around the characters and action from the hit anime series. It uses the same MetaX game engine as Panini�s other trading card game, the Justice League TCG, and can be played entirely on its own or combined with other MetaX games. The Attack on Titan Starter Deck provides everything two players need to begin, and is intended primarily for new MetaX players. The set includes two pre-constructed 40-card decks, one for the Scout Regiment and one for the Titans, as well as 20 foil parallel cards. The Starter Deck will be packaged in 6-deck display boxes. Booster packs offer a collection of 146 new MetaX cards, including four �Cross Rare� cards and two �Ultra Rare� cards. Each booster includes 12 cards, and boosters are packaged in 24-pack display boxes. Each box comes with 1 Cross Rare, 1 Active Player card, and 8 foil parallels, and half of the boxes will contain 1 Ultra Rare. Last month, Panini release the Green Lantern Booster Set for the Justice League game (see �Green Lantern Joins �Meta-X Justice League��).